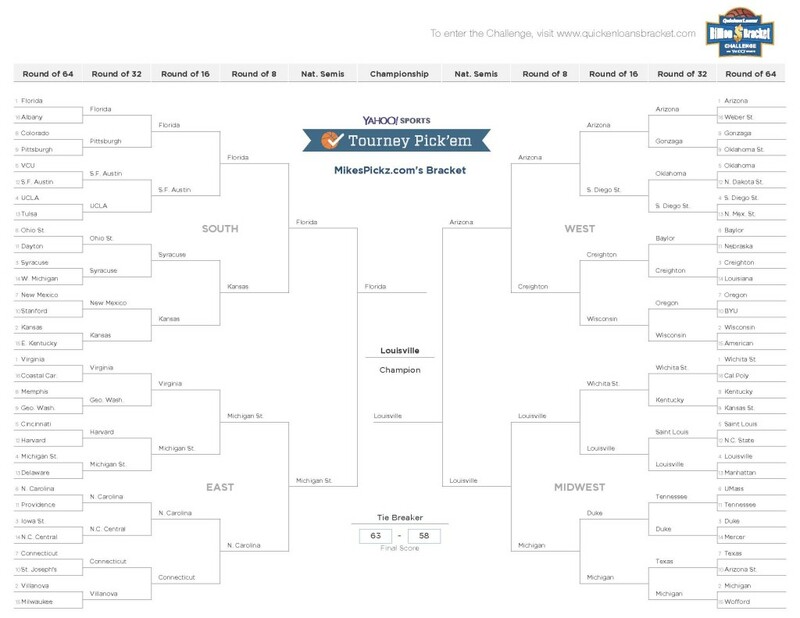 The Madness of the NCAA Men’s Basketball Tournament begins today, well it actually began with the First Four on Tuesday, but in everyone’s mind the true March Madness begins today when your brackets lock. With odds of 9.2 quintillion-to-1, Quicken Loans felt comfortable offering a billion dollar prize to anyone who enters and gets a perfect bracket. Warren Buffet’s Bershire Hathaway is happily providing the insurance on the prize (good publicity). Yahoo! hosted the Billion Dollar Bracket Challenge and brackets locked for that at 1am Eastern time. The hidden gem of the Billion Dollar challenge is the top 20 brackets will win $100,000 each, not bad. As tradition here at MikesPickz, below you will find a copy of my Official (Billion Dollar?$100,000 winning?) March Madness Bracket. I will update this post as the tourney plays on with my stats from Yahoo! standard scoring.